The Lorrillard Snuff Mill is located on the Bronx River and can be rented for weddings. It is closed for renovations at this time but it should be opening soon. I took this shot from a bridge that crosses the Bronx River. That's a cool old building. And I agree that in monochrome, at least, it does have an eeriness to it. But monochrome is conducive to that. Wow Mary, I love the creepy feel of this picture in Monochrome. Hey I just love your Christmas background here!!! What a wonderful old building. It's nice to know it is being saved and used. The B&W makes this look a bit spooky. That's a really wonderful shot, Mary. Looks spooky, too. Ooh I love the new picture at the top of your blog. Where is it? Like your new header very much. Mysterious, upward journey is invited. I'm seeing ghosties and things, dancing round the trees, and looking out the windows. The myriad grays are perfect for this shot. 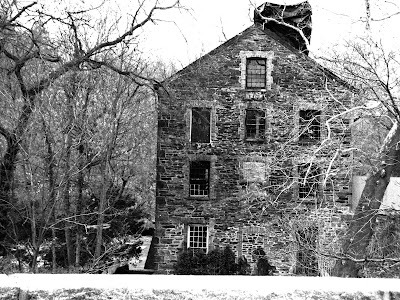 The gray winter sky complements the old mill. It would seem that the weather is devoid of life, but not really-life abounds in Nature. Yet the old building is really devoid of life - its working life left awhile ago. Both gray, yet both totally different! Very nice shot. I've never noticed this place before. Great shot. I remember that building from days gone by. I love the Bronx Botanical Gardens and the Zoo. I was born not far from there though we left the Bronx when I was 5 or 6. My only happy memories of that time are of the Zoo and Gardens. Creepy ...in a wonderful way! Love the house photo!! Very interesting..It is a very interesting building..